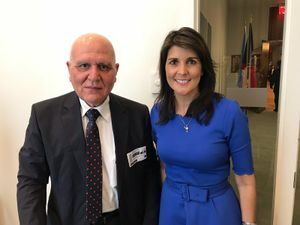 Dr. Morad of the Syrian American Medical Society meeting Ambassador Nikki Haley at the UN Security Council two days before the alleged attack. Layout of the building where the victims were first seen. ...the Syrian government allegedly launched a new chemical weapons attack in the surrounded and partially evacuated city of Douma. 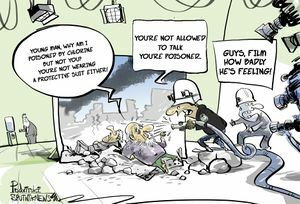 7 April witnessed two alleged chemical attacks on Douma; as reported, an aerial chlorine attack in the afternoon sickened some and killed no one. Then at 7:30 to 9:00 PM (accounts differ), a helicopter barrel bomb attack with chlorine and/or sarin (accounts and details vary). This allegedly killed at least 85 civilians, by some reports 180 or more (Zaher Sahloul), with 700-1000 said to be affected and death toll expected to climb. The development storms the "western" media, triggering outraged-sounding tweets by the US president. Unclaimed airstrikes on Syria's Tiyas or T-4 airbase follow, denied by the US, suspected by Israel, and then the largest US missile attack yet, with the aid of France and the UK. ACLOS core member Adam Larson (Caustic Logic) has taken a first look at the story over there. Some 30-40 bodies were shown in one building alone, with most videos and photos being of about 20 bodies piled by the stairs in the basement, mostly women and children. So far the victims seem to be unidentified strangers, for the most part if not totally. They tend to be in grubby street clothes, but tend to have lost their shoes along the way. They have smoke-stained hands and unexplained injuries, including what seems like healing "raccoon eyes" suggesting skull fracture in the prior days. They don't look like normal chlorine or sarin victims, appearing livid (red) more than cyanotic (blue), lacking much for red eyes (a chlorine sign), and some but limited signs of SLUDGE syndrome. The 20 bodies and others seem to be piled and re-arranged like props, and probably exaggerated with "foaming at the mouth" special effects. 3) NEW: massive morgue scene, many more victims! 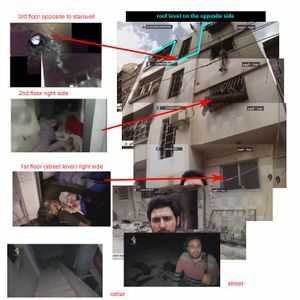 White Helmets remove bodies from Douma ghost house. Russian military police vehicle arrives somewhere , nothing found. According to Konashenkov, officers of the Russian defense ministry spoke with two Syrians who had taken part in filming the framed-up attack. Both have medical diplomas and work with the emergency department of Douma’s hospital. The two men do not conceal their names. They told Russian officers that all those who had been taken to hospital during the filming had no symptoms of exposure to toxic agents. On the MoD video, we are told (and see a brief, apparently consistent video fragment) on which the two Syrians point to themselves shown on the White Helmets video. We are told that a detailed version of this fragment will be given to journalists present at the briefing. The next day Iad Tawil published on twitter what looks like that promised material, with proper English subtitles. On April 16, Alexandr Shulgin introduced this "irrefutable evidence" to the executive council of the OPCW. 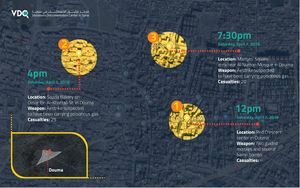 On April 14, the French Defense Ministry released a report on their "evidence" that the "Syrian regime" did it. Read by someone with rusty French knowledge, the broad line is: It is looking (by unnamed "French experts") at the "rebel"-provided videos and stories, finding they "don't look fabricated"; then trying to create a motive for Assad out of the situation in Douma at the time of the alleged attack, with the Army of Islam surrounded and on its last leg; then some vague claims about undeclared rests of the destroyed Syrian CW program; and then the usual "we know he did it because he did it before" stunt referring to last year's alleged attack in Khan Sheikhoun. Truth is @James__Harkin got the basics right in terms of #Douma's "propaganda" value. 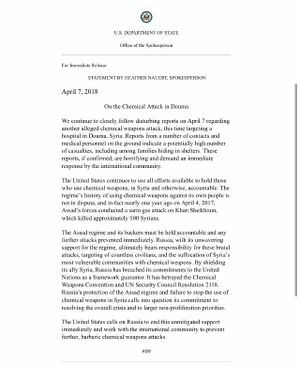 The ATTACK DID HAPPEN, sarin wasn't used, but we'll have to wait for @OPCW to prove chlorine or otherwise. However, everything else around the attack was manufactured for maximum effect.